The share of the U.S. digital advertising market garnered by newspapers shrank to the lowest level in history in 2011, according to newly published data. With the growth of digital formats like highly targeted search, mobile and social advertising vastly outpacing the ability of publishers to develop competitive new products, newspapers sold only 10.3% of the $31.7 billion in digital advertising purchased in 2011. When the Newspaper Association of America first started counting online sales in 2003, newspaper websites carried 16.7% of all the digital advertising in the United States. 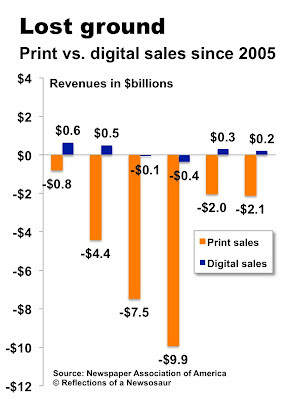 As illustrated in the green bars in the graph below, the industry’s share of online sales has declined ever since. The national online sales data comes from the Internet Advertising Bureau, a trade association that hires PriceWaterhouseCoopers – the same folks who tabulate Oscar votes – to do an annual survey of the rapidly expanding digital marketplace. While the data released by IAB last week show that total digital ad revenues in the U.S. increased by 21.2% in 2011, statistics reported earlier this year by the NAA show that digital sales grew at a les brisk 6.8% at newspapers in the same 12 months. 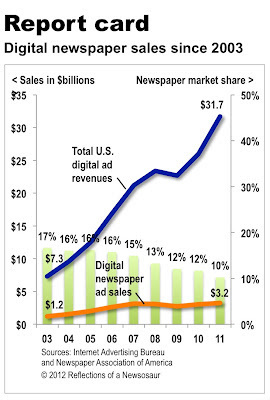 With the total digital advertising market expanding three times faster than interactive newspaper sales, it is easy to see how publishers lost market share in 2011. But, wait, it gets worse. 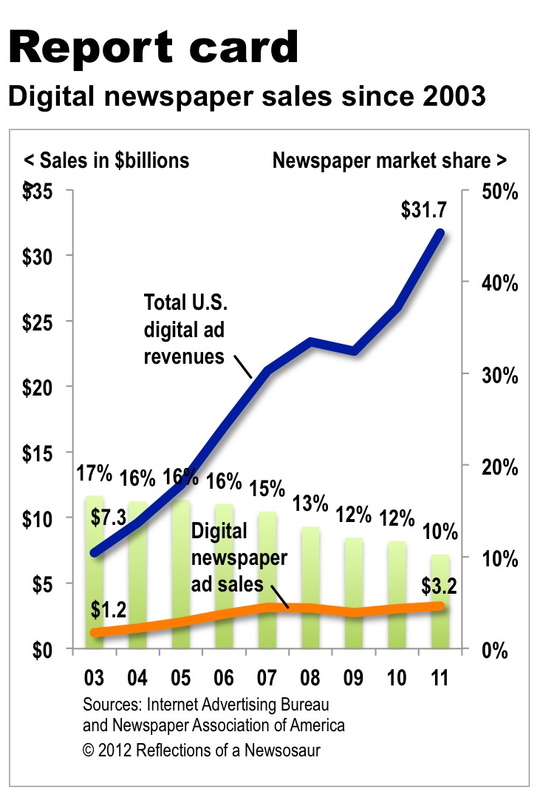 The 15-point gap between digital sales growth at newspapers and the entire market in 2011 is the biggest such difference since newspapers started reporting online ad sales. The next-worse disparity between newspapers and the entire market was when publishers trailed the growth of the over-all market by 12 points in 2008. The widening gap in sales momentum shows that publishers, notwithstanding their avowed efforts to boost interactive revenues, fell farther behind their digital competitors in 2011 than any point in history. The reason the general digital market is growing faster than interactive advertising at newspapers is that the digital natives sell many more products – especially search and targeted display advertising – than the run-of-site banner ads and classified “upsells” that most publishers have on offer. But the sales growth at newspapers trails the online industry in even in the two primary ad categories where publishers are trying to compete. In the case of banners, the 21.5% leap in online display ad sales reported by the IAB for 2011 is three times greater than the 6.8% increase in all digital categories reported by the NAA. The situation for classifieds is similarly disappointing. While newspapers dominated classified advertising in the pre-Internet era, the IAB reports that digital classified revenues grew by 8.1% in 2011 at the same time print classified at newspapers sales fell 11.0%. When I reported earlier this month that newspapers since 2005 lost $27 in print advertising for every dollar they gained in digital sales, my friends at the Poynter Institute said it would be fairer to publishers to look at the success of their going-forward digital initiatives than their past failures to respond to this emerging market. The objective data reported above are the most up-to-date information we have to gauge the real-time performance of the publishing industry. By any measure, the numbers unfortunately show that newspapers are falling ever farther behind the digital competition. Online banner ads, which are the primary source of digital revenue for most publishers and broadcasters, are among the least trusted sources of commercial information, according to an important new consumer survey. 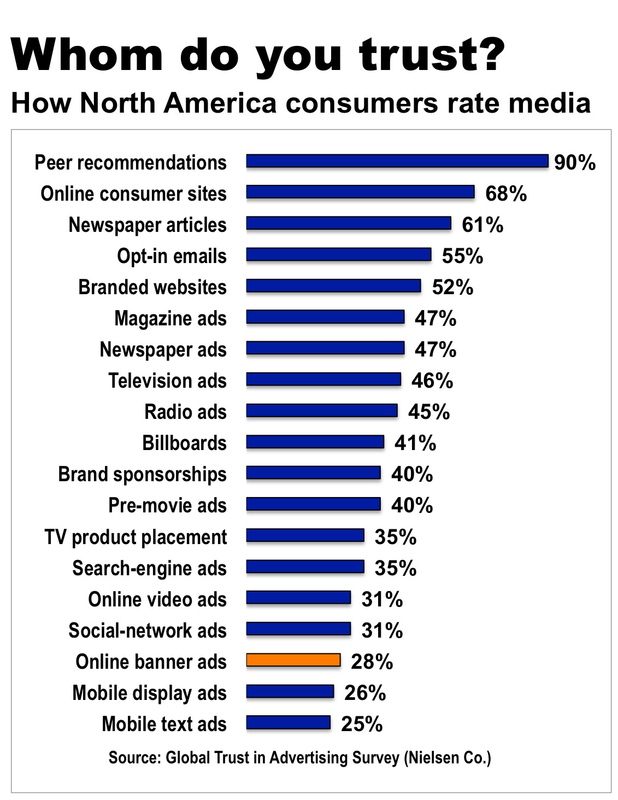 While 90% of consumers have faith in online recommendations from friends and 75% of consumers value opinions posted at consumer websites, only 28% of consumers in North America trust online banner advertising. The sentiments are contained in a global survey of 28,000 consumers that was published last week by the Nielsen Co., the market research firm. The good news in the survey for newspapers is that 61% of consumers trust editorial content about products and 47% trust print ads. But the bad news is that most publishers and broadcasters have no products to compete with the digital advertising media that have the most credibility with consumers. 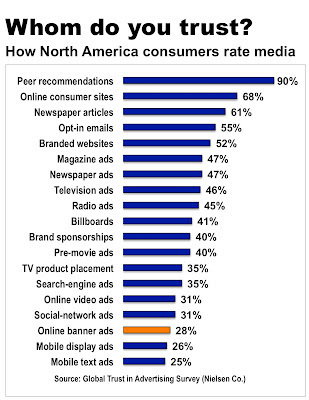 As illustrated below, respondents to the Nielsen survey put far more stock in peer recommendations and crowd-powered ratings than they do in traditional advertising, where the print, broadcast and outdoor formats retain the confidence of not quite half of the respondents to the poll. In the digital realm, search-engine and social-network advertising are held in higher esteem than online banners – perhaps because the ads tend to be targeted reasonably well to the interests and demographics of the recipients. As the Googles and Facebooks of the world gather ever more data about their users and get ever more sophisticated about how to use it, most publishers and broadcasters still run generic, run-of-site banners that can't hold a flickering candle to the laser-like ad systems operated by their abundantly funded digital competitors. Because ad dollars are sure to follow consumers in the fullness of time, the inadequacy of their online ad platforms spells a big problem for the legacy media. Nearly two decades after the commercial debut of the Internet, most publishers still are applying the anachronistic newspaper model to their digital businesses. This is nuts. And it has to stop, if publishers have any hope of retaining a semblance of the relevance, readership and revenues that historically made them the influential and commercially successful enterprises they would like to continue to be in the future. Although readers and advertisers are flocking to the proliferating digital media as fast as they can, the stubborn fact is that most newspapers derive only about 10% of their revenues from digital products. 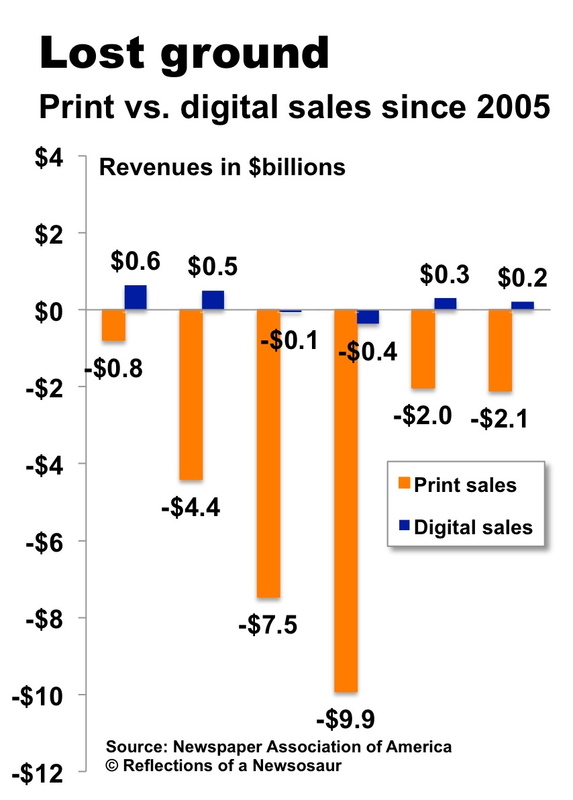 While it is true that the relative digital contribution to newspaper revenues has grown in recent years, the gain has more to do with the 50% plunge in aggregate advertising sales since 2005 than a truly meaningful increase in digital revenues. In other words, the numerator looks bigger because the denominator shrank. Instead of using the web, mobile and social media to connect with new readers and customers, the typical newspaper dedicates the majority of its digital efforts to faithfully porting its print product to pixels. The typical newspaper website is heavy on words and light on interactivity. Most mobile products fail to leverage the power of this intensely intimate medium to deliver personalized and localized information to solve immediate individual problems. The “we-talk, you-listen” Facebook pages maintained by most newspapers almost universally fail to build community, which, of course, is the entire point of social media. In light of the above, it is not surprising that the audiences attracted to newspaper-centric digital products look remarkably like print customers. “The average print reader is a female nearing 60, when the age of the average population is 43,” says Greg Harmon of Borrell Associates, who has been tracking web readership at newspapers for a decade. “The user of a newspaper website is a little less female than the print subscriber and just over 50 years old, but the average age of the online newspaper audience gets one year older every year.” Unless publishers use their digital media to attract younger and more diversified audiences than they have today, the future of their business would seem to be limited to the lifespan of their aging readers. While online ad spending is expected by PricewaterhouseCoopers to double from current levels to $62 billion by 2014, newspapers today have no ability to compete in such fast-growing categories as search, mobile, social, video and targeted banner advertising. Because they have not invested in modernizing their advertising capabilities, publishers are stuck with offering un-targetable banners and online upsells from their tattered print classified businesses. Further, researchers say the folks who formerly bought local advertising are spending ever-greater portions of their budgets on direct contact with consumers via websites, search-engine marketing, daily deals, couponing, contests, social media and e- or snail mail. Borrell believes as many as $3 out of every $4 spent on local digital marketing this year will go to non-advertising venues. Most newspapers have few products to capture those dollars. In addition to traditional broadcast and Yellow Pages sales pressure, newspapers today must compete with a growing number of digital reps for everyone from Google and Groupon to local webmasters and social media agencies. 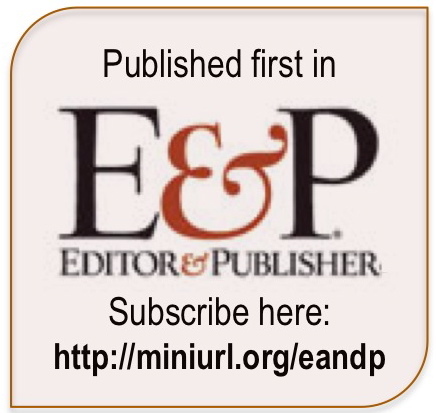 Estimating that there now is one digital rep to rival every three salespeople fielded by newspapers, Borrell reports that the typical small business gets more than 20 pitches a month from an advertising or marketing representative. Although research shows many businesses continue to value their newspaper reps, even the best relationships can’t make up for a lack of the digital and marketing products that merchants increasingly are buying. In perhaps the single biggest challenge the industry must overcome, newspaper reps can’t possibly sell digital products they don’t understand, can’t explain or don’t believe in. Though most publishers are further behind the curve than they ought to be (and think they are), newspapers continue to possess powerful brands, content-creation capabilities, sales relationships and marketing muscle. The first step to getting serious about digital publishing is to develop a strategic commitment to building relevant and remunerative products. Because most profit-pinched newspapers lack the time, money and in-house talent to develop such products, it makes sense for the industry to pool its resources to create a Digital Widget Works to build products to compete with the upstarts. The time to act is now. The contest will only get more intense, with Groupon, LinkedIn, Facebook, Twitter, Yelp and a host of wannabes feasting on fresh capital faster than you can spell IPO. 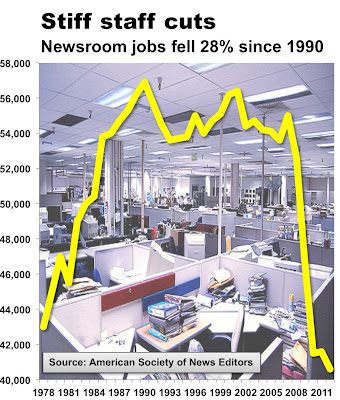 The number of journalists working at U.S. newspapers today is at the lowest point since the American Society of News Editors began its annual newsroom census in 1978. Newspapers now employ 40,600 editors and reporters vs. a peak of 56,900 in the pre-Internet year of 1990, according to the census released today. 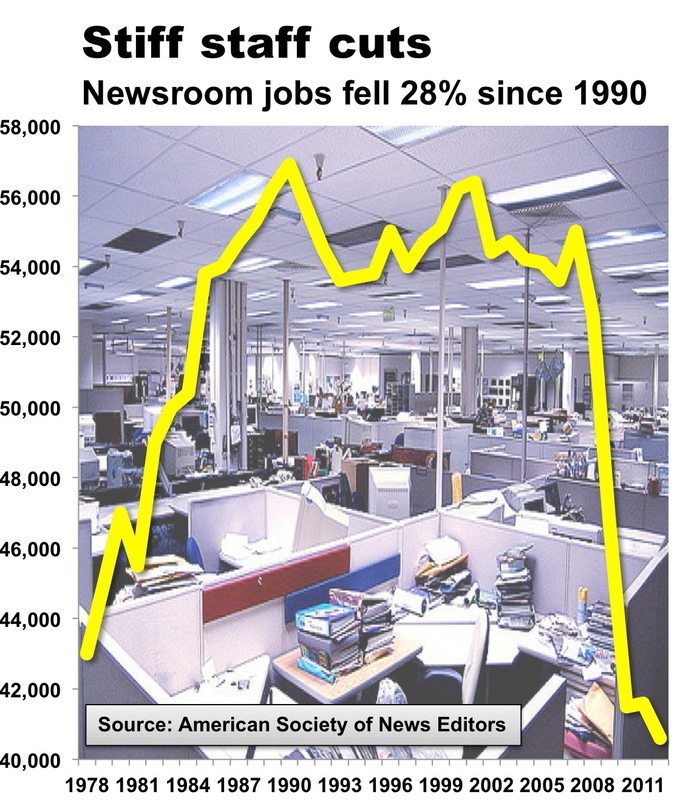 Thus, newsroom headcount has fallen by 28.6% from its modern-day high. As illustrated below, the most precipitous drop in staffing occurred in the depths of the recession between 2008 and 2010. The ASNE census was started when the industry became concerned about addressing the lack of minority staffing in newsrooms in the late 1970s. Editors and publishers reasoned, properly, that greater diversity in newsrooms would improve the quality and quantity of reporting about all segments of society. The first survey in 1978 discovered that members of minority groups held only 3.6% of newsroom jobs. In 2012, the number is a more respectable 12.3% of positions. While this statistic represents a considerable improvement over the years, the figure is below the peak minority employment of 13.5% achieved in 2008. 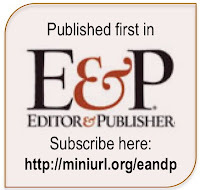 Footnote: The ASNE formerly was known as the American Society of Newspaper Editors but decided to modernize its image a few years ago by taking the P-word out of its name. After changing hands three times in six troubled years, Philadelphia’s legendary newspapers were sold Monday for a tenth of the half-billion dollar price they fetched as recently as 2006. The stunning plunge in the value of the Philadelphia Inquirer and its sister properties reflects not only the continuing contraction of the publishing business but also provides a rare glimpse into how badly newspapers have fallen out of favor among investors. A decade or so ago, the Inky and the Philadelphia Daily News, its feisty tabloid sibling, would have been worth the batter part of a billion dollars in the unlikely event that their then-owner, Knight Ridder Inc., were willing to part with them. On Monday, the papers – along with their companion website Philly.Com – were sold to a group of Philadelphia businessmen for $55 million, according to the Inky. The new buyers will be the third owners of the Philly media group since the various assets of KRI were sold in 2006 at the prompting of activist shareholders who presciently thought it was a good time to exit the newspaper business. The first buyer of the Philly papers was the McClatchy Co., which bought the entire Knight Ridder chain for $4.4 billion but then elected to sell the Philly papers (and certain other titles) without ever taking possession of them. McClatchy flipped the Philly properties to Brian Tierney, a peripatetic public relations man who assembled a group of Philadelphia investors to pay $515 million for the publishing group. As both the economy and newspaper ad sales tanked in the ensuring years, Tierney & Co. were forced into bankruptcy in 2009 when they could not keep up with the interest payments on more than $300 in debt they had borrowed to finance the acquisition. The rights of Tierney’s unpaid creditors were acquired by Alden Capital Management and Angelo, Gordon & Co., two financial firms who specialize in buying distressed debt for pennies on the dollar to gain control of beleaguered companies that they then fix and sell to a new buyer at a profit. After an extended tussle with Tierney, who tried to buy the company out of bankruptcy with an alternative bid, the distressed-debt investors won control of the Philly papers in 2010 by paying $139 million. The fix-up planned by the investment firms fizzled, owing to continuously falling ad sales and stubbornly high operating costs that include a batch of hard-to-change legacy union contacts. The frustrated owners earlier this year put the company up for sale, paving the way for the transaction Monday that put the value of these iconic newspapers at a fraction of what they were worth just six years ago.